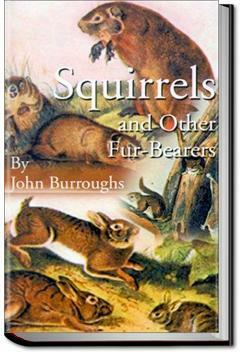 Squirrels and other Fur-Bearers, a collection of essays by American naturalist and essayist, John Burroughs, provides fascinating insight into the daily life of small woodland creatures. Included in these essays are Burrough's personal observations of squirrels, rabbits, mink, and chipmunks, as well as numerous other small mammals. Highly recommended for anyone, both young and old, with an interest in nature and wildlife. . . .On some still day in autumn, one of the nutty [p17] days, the woods will often be pervaded by an undertone of sound, produced by their multitudinous clucking, as they sit near their dens. It is one of the characteristic sounds of fall.